1944 I was a member of a small night patrol out on reconnaissance in the Ardennes in Belgium after a brief skirmish with a German machine gun outpost we headed back towards our lines. On the way back we were challenged by an American machine gun outpost. In the confusion of the battle none of our patrol members knew the password. 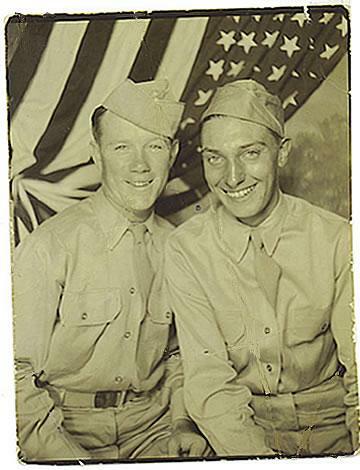 Knowing German soldiers were using captured American uniforms the right password meant life or death I had to think fast. Whatever made me answer this way, I will never know, I yelled out, ''We are Americans. We don't know the password. But if you are a GI, we'll kiss your f--k--g a-s''. The sentry knew no German could curse like that, we were allowed to enter our lines. The irony of this incident fell into place 40 years later at our annual division reunion. While chit-chatting with my buddies from "E" Company. This incident came up. I never knew the G. I. sentry who challenged our patrol that night. To my amazement, Bud Black from Kokomo, Indiana told me he was that sentry. His finger was ready to squeeze the trigger on his machine gun, when he heard my reply to his challenge. The language convinced him we were American G. I.'s. I hesitated to tell this story because of the language. In reality I thought it saved our lives. 12/17/1944 A little after midday Dec 17, 1944, Company E advanced combat-ready into the woods. I heard an explosion in front of me. Lt. Thomas of Madison, Wisconsin had stepped on a mine which threw him into the air. Company Commander Lt. J Lennon of New York City yelled out "he is dead, keep advancing." Soon we came to a small road and all hell let loose. German and American artillery were shelling us. German snipers and machine guns raked the area. Many brave and good men gave their all that Sunday. This gave us the resolve to fight for victory. A day or two later we left the woods, vowing to remember our comrades who died in the Saar Basin. 2/26/1945 On February 26th, 1945, Company E led the way followed by F and G. Their supporting tanks and tank destroyers moved up behind, utilizing an alternate route. 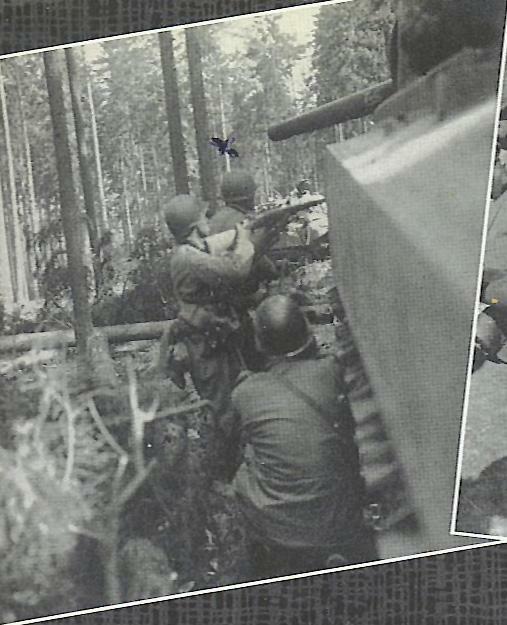 An hour and a half later E Company was held up in a draw one kilometer east of the jump off point. Snipers opened fire, and soon mortar shells began dropping all over the area inflicting numerous casualties. Lt John Ford, Gatonia, North Carolina, Tech Sergeant Vernon E Howe, Muscatine, Iowa, and one squad of men pushed across a creek and an open field to the next patch of woods. The Germans let the one squad cross, then opened fire with mortars and machine guns. The opening later proved to be the Germans final protective line with crossfire where E Company was attempting to cross. The creek afforded protection for several of E Company's wounded until they were able to be evacuated. Lt Ford and his squad stayed in the booby trapped woods until evening when he could safely infiltrate his men back. An attempt to move to another area was thwarted by a booby-trapped field. Company F moved up to reinforce Company E's lines and protect their flank. I was part of the squad that crossed the creek. I was wounded there by a sniper in the early afternoon, and didn't get out until late that night. James Hennessey Paris 1945. Members of E Company. Top - PFC James Hennessey, Bayonne, NJ. 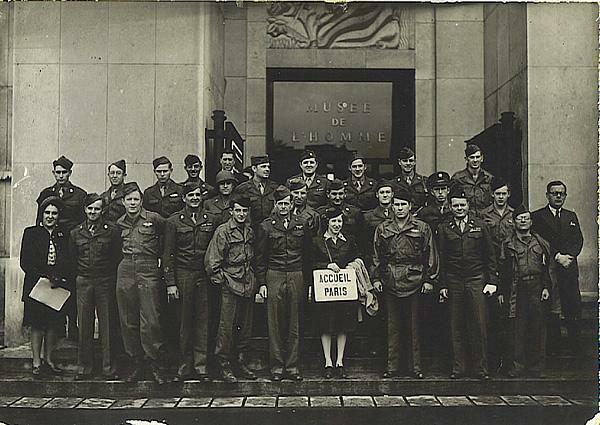 Middle - PFC Lewis Lospilluto, Jersey City, NJ On tour as guests of the Mayor of Paris - September 1945. James is bottom row, third from left. 1944 - Columbia S.C. while statoned at Fort Jackson S.C. Crew cut is Sgt. William H Rollins - San Francisco, California. 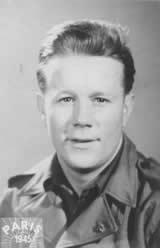 Died of Wounds received Feb 26, 1945 on March 5th, 1945 - Wounded vicinity of Neunensten-Germany. 1944 - Columbia S.C. while statoned at Fort Jackson S.C. The one with cap on is P.F.C. 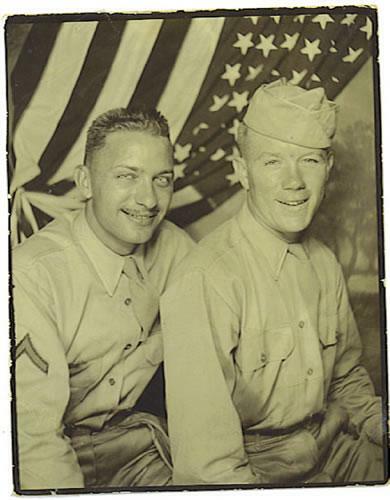 Ernest A Deubel-Newark N.J.- KIA late Dec 1944 in Saar Basin, Germany was good friend. 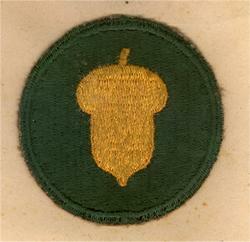 87th Division known as the Golden Acorn under Patton's 3rd Army.